KIM JONG UN said the DPRK and Cuba " are in the same trench in the struggle for defending sovereignty and dignity of their countries and safeguarding international justice"
The reception given to comrade Miguel Mario Diaz-Canel Bermudez in Pyongyang by the party , people ,government and supreme leadership of the DPRK is an example of militant anti-imperialism and proletarian internationalism in action. 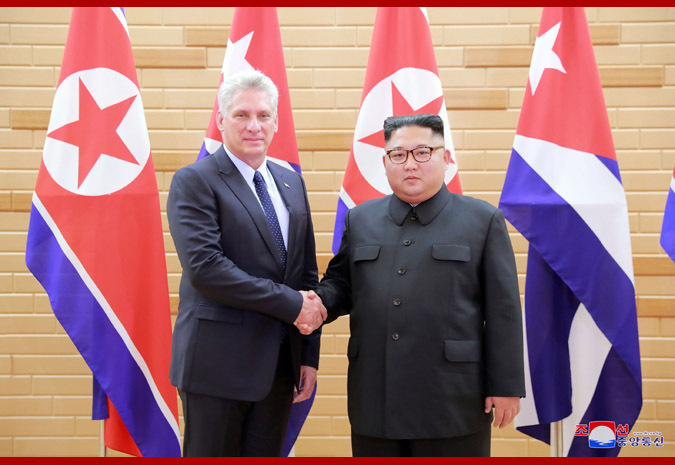 We believe that the successful visit of comrade Bermudez will carry the DPRK-Cuban friendship to a new and greater heights . We believe that the visit will have a positive effect on socialist construction in both countries. The visit will greatly contribute to the strengthening of the unity of the international communist movement and the socialist countries ! 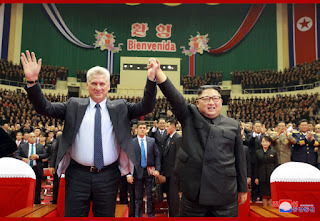 LONG LIVE DPRK -CUBA FRATERNAL FRIENDSHIP !